I have managed to make a small inroad into my previous photo-shop ignorance, and battled with seemingly un-logical technology to make-up a pattern for another Spoonflower fabric contest. It isn't until October and I do not expect to win as my taste and technical know-how seems to vary wildly with the usual winners, but still I do it because I want to, and I like doing it. So this is my latest offering. Ahem! zombie party girls is a cut and sew pattern for stuffed zombies, with an extra bit of zombie inspired ( eyeballs, hearts, dripping blood etc) fabric on the side, for anything that takes your fancy. 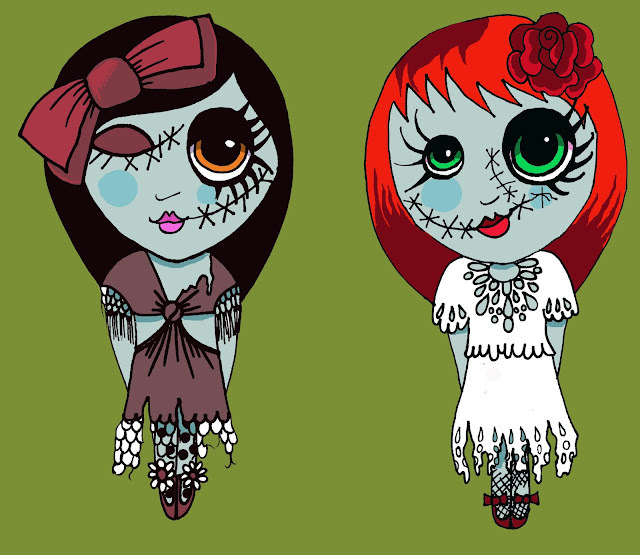 I had fun designing their dresses, so I hope they look glam enough if not a little dishevelled. I have just had to change the colours on my entry as informed by my 13 year old that the green was not so good. I think she is right too, so now it is purple. also the name is lame, apparently, but I will just have to leave it for now. Note to self "consult 13 year old before doing anything first." I already use my 9 year old as my stylist, when I get dressed to go out of an evening. Yep, I'm with you on taking advice from daughters. As I stray into my dotage I plan to retain the services of Miss Pimp as technical advisor on all things geeky. If that's the purple, I do actually prefer it to the green! Yes the purple is much better, I don't know what I was thinking, except that purple harks back to the eighties Goth/ hippy thing and I find it hard to break out of my embarrassment at the dreadful clothes I used to wear in those days (many of them purple, tie-dyed and possibly even tassley).